Hosting Talkaoke is a bit like playing a musical instrument. Essentially there’s no right or wrong way to do it. The more practice you have, the better you will be. Be yourself and your own style, personality and talent will emerge. At The People Speak, we are always learning new elements to it. Have a go in the middle of the table and you too could eventually be contributing to these pages. Get yourself in the middle of the table. You’ll learn every minute! The most important thing to remember is that Talkaoke has two main rules. Everything else is just a guideline. The prohibition of singing is more important than it seems. It’s not out of any antipathy to the world of song. Once the singing starts it’s hard to return to discussion. The no fighting rule is self explanatory. It is important to be able to differentiate a healthy and productive difference of opinion from personal antagonism and insult. Spotting this and how to diffuse difficult situations is covered later. 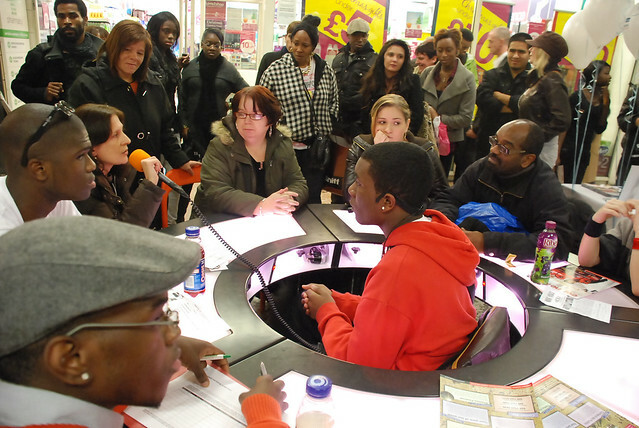 Remember the design of the Talkaoke table is conducive to consensus and empathy, so everything is in your favour. Here are some tips on how to get the right circumstances to make your Talkaoke successful. Our Preparation page shows you how. This entry was posted on Monday, January 7th, 2013 at 5:40 pm. It is filed under Facilitation Training, Talkaoke. You can follow any responses to this entry through the RSS 2.0 feed. – The People Speak. Now i’m highly amazed that somebody would piece of writing something similar to this. This reminds me a modicum of anxiety remedy but that’s an alternative history exclusively.